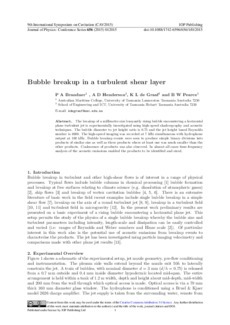 The breakup of a millimetre size buoyantly rising bubble encountering a horizontal plane turbulent jet is experimentally investigated using high-speed shadowgraphy and acoustic techniques. The bubble diameter to jet height ratio is 0.75 and the jet height based Reynolds number is 4000. The high-speed imaging was recorded at 7 kHz simultaneous with hydrophone output at 100 kHz. Bubble breakup events were seen to produce simple binary divisions into products of similar size as well as three products where at least one was much smaller than the other products. Coalescence of products was also observed. In almost all cases time-frequency analysis of the acoustic emissions enabled the products to be identified and sized.